Yet another job, claimed by machines. Mercedes-Benz has taken one step further in automation of cars, this time with a more evolved form of autonomous parking. 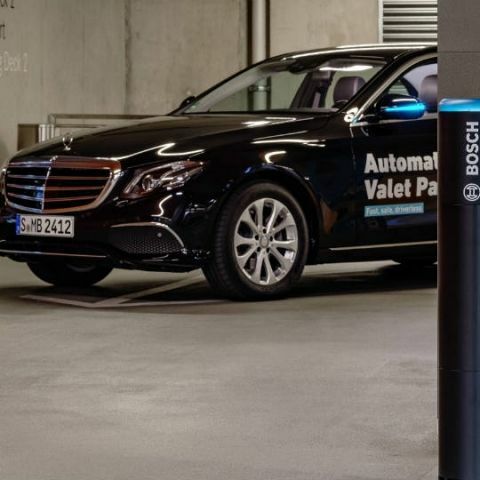 The automaker and the supplier have come together to create the automatic valet parking system, and the technology is now being tested in its pilot stage at the parking bay of Mercedes-Benz Museum in Stuttgart, Germany. The service is operable via a smartphone app, where you reach the concerned destination, and simply open an app on your phone to select automatic parking. Following this, the car simply drives away into the parking lot, and finds a place for itself. The car's ORVMs glow blue when this mode is activated, and it uses the standard array of connected vehicle data, proximity and imaging sensors to execute the autonomous parking maneuver. The rest of the implementation is done by Bosch, who built the intelligent parking setup that monitors vehicle motions and prevents potential collisions. Like every autonomous driving technology experiments, this too is under trial, and regulatory bodies are overlooking its efficiency and progress before it gets certification. Nevertheless, this can be an efficient way to mass-manage parking at public places, and decrease the hassle of having to look for your car in overcrowded parking lots. Valet assistants, it seems, are set to go into oblivion, at least for Merc owners. Do automatic parking systems really work? HTC will launch smartphone which will have two operating system android and windows?